HÀ NỘI — Police in Hà Nội’s Thanh Trì District have charged two men for counterfeiting seals and documents of organisations and agencies. Nguyễn Văn Thắng, 27, from Nam Từ Liêm District, and Lê Trần Tiến, 26, from Thanh Xuân District, were alleged to be members of a ring of counterfeiters preparing health examination papers in Hà Nội. 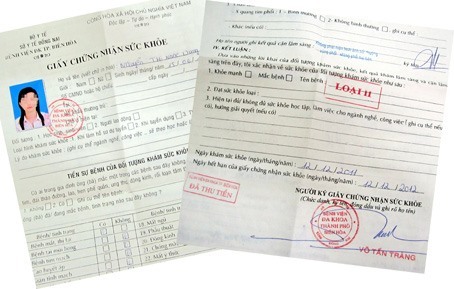 Initial information showed that in late September, police in the Department of High-Tech Crime Prevention (known as C50), and police in Thanh Trì District caught Hoàng Mạnh Hùng red-handed in Tân Triều Commune transporting about 50 fake health examination papers with seals from the Transport Hospital JSC. Police made a raid on Hùng’s house and found more than 700 fake health examination papers with Transport Hospital seals. The papers had results of medical examinations, but had no name of patients. After quick investigation, police caught Thắng and Tiến. At the police office, Tiến admitted that he and Thắng counterfeited health examination papers and sold them for between VNĐ50,000-200,000 (US$2.2-8.8) since mid August. The two suspects allegedly hired Hùng to find customers and paid him commission.